Ministers have failed to include the Department for Work and Pensions (DWP) in a new cross-government plan aimed at reducing suicides, despite years of evidence linking such deaths with the disability benefits system and social security reforms. The Department of Health and Social Care’s (DHSC) first Cross-Government Suicide Prevention Workplan details how it will work with a string of government departments and other organisations to cut the number of suicides. 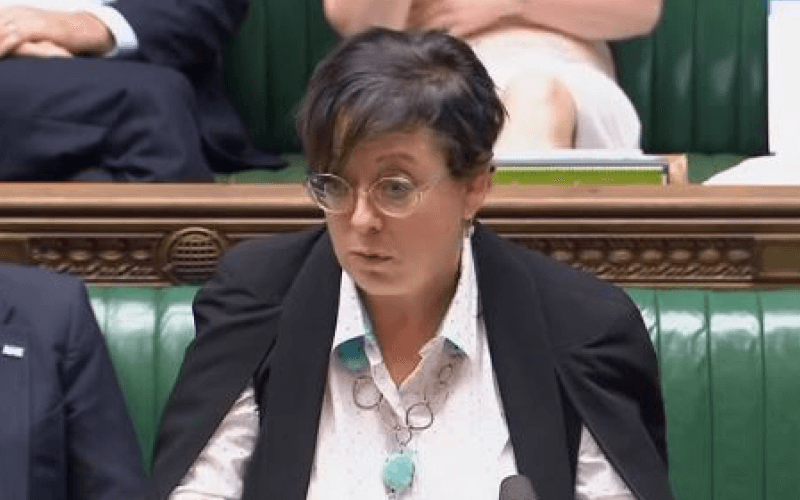 But there is not a single mention of DWP, the benefits system, employment and support allowance (ESA) or universal credit in the plan, which is led by suicide prevention minister Jackie Doyle-Price (pictured). This also means that ESA and universal credit claimants are not included among the high-risk groups mentioned in the work plan. This is despite years of research that have shown clear links between the government’s social security reforms and suicides and have demonstrated that ESA claimants are at particularly high risk of suicidal thoughts and behaviour. Three years ago, public health experts from the Universities of Liverpool and Oxford showed in a study that, across England as a whole, the process of reassessing people on incapacity benefit for the new ESA between 2010 and 2013 was “associated with” an extra 590 suicides. The following year, NHS Digital’s Adult Psychiatric Morbidity Survey showed that more than 43 per cent of ESA claimants had said (when asked in 2014) that they had attempted suicide at some point in their lives, compared with about seven per cent of non-ESA claimants. Only three months ago, Disability News Service (DNS) reported how a man with learning difficulties died a month after attempting to take his own life, following a move onto the government’s “chaotic” universal credit benefit system that left him hundreds of pounds in debt. That followed years of secret internal DWP investigations into the suicides of benefit claimants, and two reports by coroners that linked flaws in the work capability assessment (WCA) system with suicides. But despite these years of research and evidence, first person accounts of family tragedies, and the NHS data, the government has omitted DWP from the workplan. Doyle-Price has repeatedly refused to highlight that ESA claimants are a high-risk group in her cross-government suicide prevention strategy, or to alert local agencies to the NHS Digital figures. The aim of her workplan is to “drive implementation” of the national suicide prevention strategy, and it claims that it “commits every area of Government to taking action on suicide”. The omission of DWP from this new workplan contrasts with the many organisations DHSC is working with. These include the Department for Digital, Culture, Media and Sport; the Ministry of Defence; the Ministry of Justice; the Department for Transport; the Government Equalities Office; the Department for Education; and the Home Office. It is also working with organisations including Public Health England (PHE), the Sport and Recreation Alliance, Universities UK, the Office for National Statistics, the prison and probation service, the Care Quality Commission, Health Education England, the Local Government Association, the Maritime and Coastguard Agency, the British Transport Police, Network Rail, the Royal National Lifeboat Institution, Transport for London, and Highways England. Public Health England has itself been implicated in the government’s continuing attempts to cover-up links between DWP policy and suicides. Two months ago, the government’s public health agency published the latest update of its Suicide Prevention Profile, which is designed to help public bodies draw up their own local suicide prevention plans. The profile includes 25 risk factors for suicide, but DNS reported how PHE had ignored the proportion of the population in local areas that claims ESA as one of those risk factors, even though it was aware of the NHS Digital figures. This week, a DHSC spokesperson refused to say why DWP was not included in the workplan and whether Doyle-Price would apologise for omitting DWP and correct that omission. And he declined to say why DHSC was refusing – including through the workplan – to warn agencies and departments that ESA claimants were at high risk of suicide. But he said in a statement that there was DWP “representation” on the cross-government suicide prevention strategy delivery group. He said: “The delivery group will ensure that the suicide prevention workplan published earlier this month is implemented and continues to evolve as new actions to prevent suicide are identified. He also pointed to a section on “people in receipt of employment benefits” in the fourth annual update on the government’s suicide prevention strategy, published last week. This section of the progress report includes a brief update on DWP’s work on mental health and employment, including its much-criticised programme to install job advisers within NHS talking therapy services; its guidance for WCA assessors on dealing with ESA claimants at risk of suicide; resources for its own staff on managing declarations of suicide and self-harm intent; and its use of secret internal process reviews when a claimant dies through suicide. The DHSC spokesperson added: “The government is committed to reducing suicide which is why the prime minister announced the first minister for suicide prevention in the UK.